Ozzie and Harriett reached sexual maturity in three years. Some ospreys take longer, but of course Ozzie did not. The spring and summer of 2010 (Age 3 months – 18 months); was spent at Lake Maracaibo. Their second breeding season, the spring and summer of 2011 (Age 20 months – 2 years); was spent on The Red Channel Marker, in the North River of Carteret County. Harriett wanted to go back to the Chesapeake Bay area, but it is the male who chooses the nesting site, and Ozzie choose Carteret County. The spring and summer of 2011 was The Summer of Fun. – Migration home was easy that year. – Ozzie and Harriett are head over heals in love with each other. 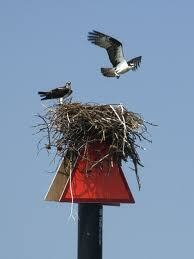 – They build a very nice nest for themselves on The Red Channel Marker. – Harriett becomes an expert homemaker. – Ozzie becomes an expert fisherman. – Ozzie becomes poetic and recites a beautiful poem to Harriett. – No eggs were laid, no chicks were born. It was not a nest failure, but a time of maturing love. The spring and summer of 2012 (age 3 – 4 years); was different. Ozzie’s return to the The Red Channel Marker was the most memorable and life altering experience of his life. Some birds, in retrospect, recall difficult, overwhelmingly painful times in their past, with nostalgia, and think of them as learning experiences. But what was about to come down in Ozzie’s life, can in no way be remembered as beneficial.